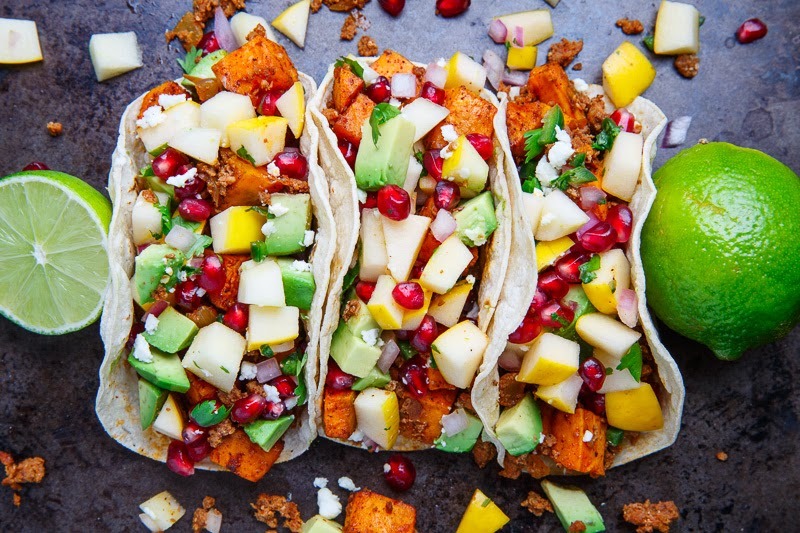 Spicy chorizo and sweet potato tacos with a fresh apple and pomegranate salsa, avocado and queso fresco. Now that I had the homemade chorizo and the apple and pomegranate salsa made it was time to use them in some tacos! 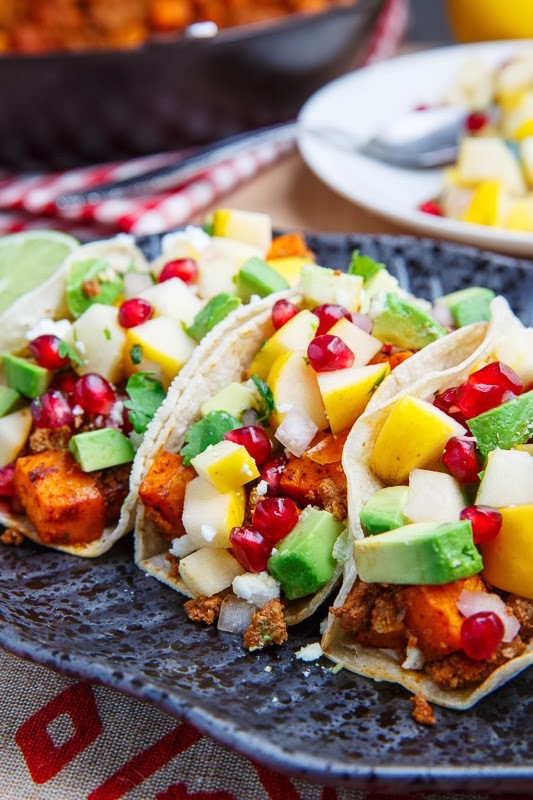 For these tasty winter themed tacos I started with the chorizo to which I added some chipotle roasted sweet potatoes and onions which was all topped off with the apple salsa along with some cool and creamy avocado and crumbled queso fresco. 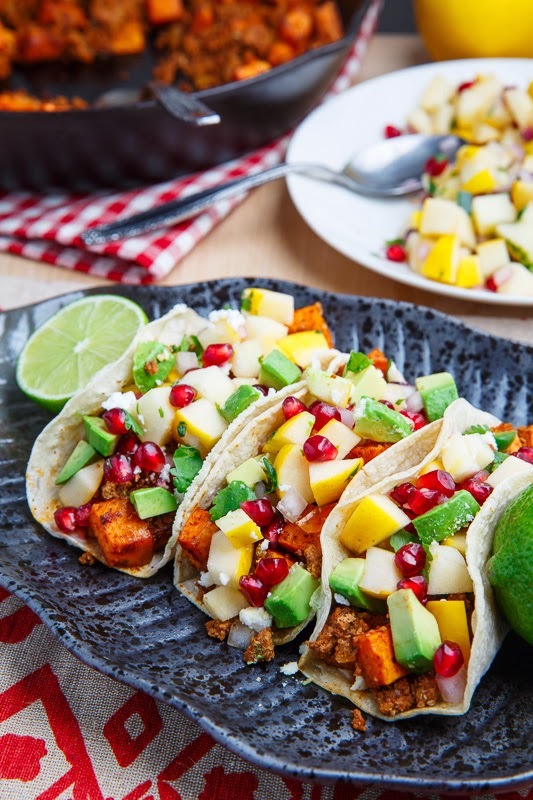 The spicy chorizo pairs perfectly with the sweet potatoes and the crispy and juicy apple salsa complements and contrasts them with flavours and textures and you rally cannot go wrong with the addition of the avocado and cheese! Toss the sweet potato in the oil, chili powder and cumin, place on a baking sheet in a single layer and roast in a preheated 400F/200C oven until tender, about 30 minutes. Meanwhile, cook the chorizo and onion in a pan over medium heat and set aside. 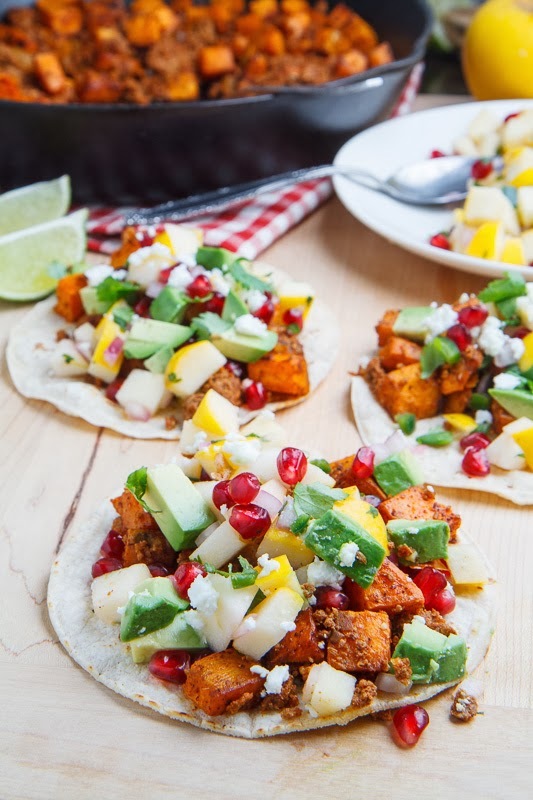 Mix the sweet potato into the chorizo, divide between the tortillas, top with the apple salsa, avocado and queso fresco. Tip: Make the salsa the day before to save time. Wow these look killer! I can see how the spicy chorizo pairs perfectly with the sweet and refreshing salsa!! The salsa seems similar to my charoset which has apples and pom seeds! Love this! Sue/the view from great island: The salsa is great all by itself! Amazing! Love these tacos. So pretty! Wow I love it. Its perfect for my diet and its so healthy. Thanks for sharing this. My mouth is dripping right now. Really! I'm imagining that these tacos are dancing in my taste buds. This is what i want for lunch tomorrow!!! Hurry for mexican! These are the best tacos ever! !